The pasta would be done just in time for Kids In The Hall, our fave show. Good times! We would grate cheddar cheese on top and then pour on the Parmesan cheese. It was also made with real mayonnaise. This is a vegan version of that recipe. It comes very close. Feel free to add your spin on it. Add things here and there. Be creative! Want to know what others thought about this recipe? Would you like to comment on this recipe? 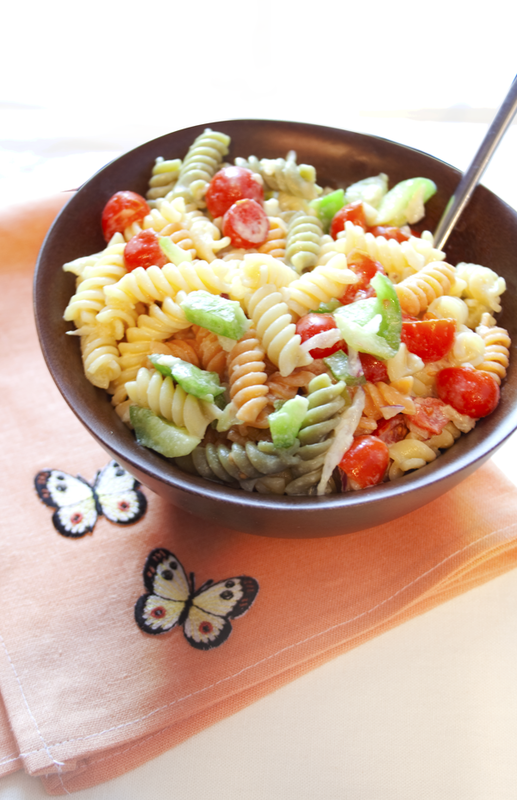 Go to the Friday Night Pasta Salad (Low Fat) blog entry. Prepare Rotini as directed on the box. To make the dressing you will need an immersion blender with a cup. There are too few ingredients to make it in a blender. Place in the immersion blender cup all of the dressing ingredients and blend until creamy smooth. When pasta has finished cooking and is perfectly al dente, drain the pasta and immediately run cold water over them to cool them down and stop them from cooking. Make sure to drain the pasta very well. You don't want wet pasta. 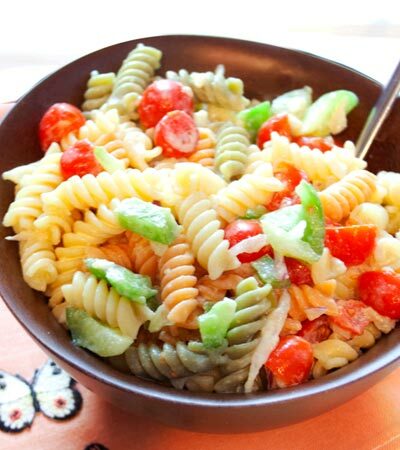 Put the pasta back in the pot you cooked them in and place onion, pepper, tomatoes and dressing and toss together. You can finish it off with a sprinkle of nutritional yeast if you have it.